Give your youngest patrons the best seat in the house with this Lancaster Table & Seating Ready-to-Assemble wood booster seat / chair with natural finish! Unlike some plastic booster seats, this beautiful wood booster seat can proudly be displayed at the tables in your restaurant, hotel, cafe, or banquet hall to provide small children with the extra boost they need to enjoy their meal. Giving your young patrons seating that is the right height for them will not only keep them safe, but prevent accidental spills and messes as well! Each Lancaster Table & Seating booster seat is constructed of solid wood with an elegant natural finish and features comfortable nylon straps for extra security. In addition to the sophistication it provides, the glossy wood finish of this booster seat also makes it easy to clean. 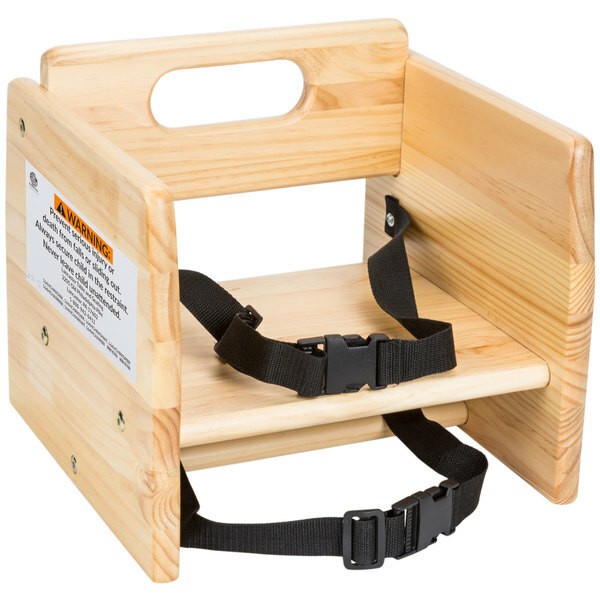 The natural light finish wood booster seat is perfect for keeping your tiny customers safe and secure during mealtime without sacrificing the style of your decor.